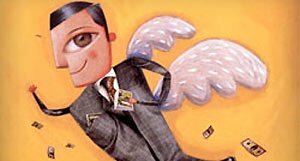 Peter Adams, "Angel Investing is Not as Risky as You Think"
Angel investing involves capital investments by accredited investors(people with a net worth of $1 million or more excluding the value of their primary residence, or with income of $200,000 or more per year/ $300,000 for a married couple). These investments are in startups, usually with less than $1 million in revenue and less than five years old. These startups have high growth potential and angel investors look to invest in companies that have a believable plan to be able to return 10X their investment or more within five years. Andy Angel’s returns are a bit more complicated. The statistics about how many startups fail on average can be deceiving. Many of those statistics come from the SBA or local Secretaries of State who report failures of hair salons, restaurants and lawn mowing services along with other companies. But, companies that receive venture capital investment have to reach a higher bar than just registering with the state. They need to have gained significant traction and have gone through a lot of due diligence and had to jump the hurdle of convincing dozens of angel investors to write a check. These companies are far less likely to fail than the general population of company formations. In fact, HALOreport data shows that about 52% of these companies will return less than $1.00 for each dollar invested. Of that 52%, about 18% will be complete failures. So, we’ve been a little hard on Andy Angel and had him with three total losses and three returns of less than a dollar. On the upside, we’ve also been a bit conservative. About 5% of venture backed startups will return 30X or greater, and there’s a good distribution of returns between 10X and 4X. These winners more than pay for the losers. Joyce Feustal, "Maximize your LinkedIn Experience"